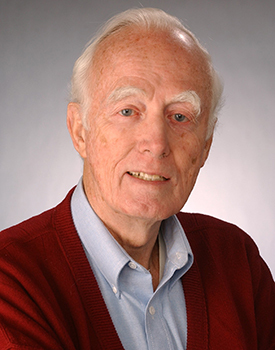 A couple of weeks ago I attended a memorial service for one of my graduate school professors, Ralph Ketcham, who had died last spring. A great and productive scholar and teacher, active up until the end. A lot to admire. I wanted to finish Ralph’s final book, Public Spirited Citizenship: Leadership and Good Government in the United States, before I wrote more about my experience with him. As in so much of Ralph’s scholarship, James Madison’s political writings, and Madison’s quest for a “republican remedy for the diseases most incident to republican government,” weighs heavily on this book . But Ralph covers much more ground than that, from Plato to Cicero, to Erasmus and Swift and Pope and Jefferson and, of course, Publius. Ralph said that the authors of the Federalist spoke enough with one voice that they should be considered as one, even if I never quite believed that. Ralph lamented in this final book the loss of public spirited-ness, a common theme in the works of the political writers he spent his career studying. He lamented how the factionalism which Madison sought to control had broken the republic into a menagerie of competing “interest” and “identity” groups, each pursuing their own tribal interest. This tribalism placed, and places, little value on far-sighted leadership and, importantly, it asks little of citizens other than that they register to vote for this cause or another, and that they mobilize and join with others of like mind and devotion to the same cause to protect their partial interests. The notion of a public good had shriveled in the heat of this factional competition, stoked by leaders who looked only to their next election. I had not seen Ralph in the several years before he died, and I wonder how hopeful he was for the future. Not after the electoral college placed in the Oval Office a corrupt and unlettered brute free of the tiniest ounce of public-spiritedness and bearing nothing more than a narcissistic devotion to his own reputation, image, and desiccated sense of honor. If one wanted evidence that “the people” had failed, that the system had not worked, the election of a man so clearly devoid of all but the most minimal qualifications for the office and whose fitness for the job has been openly questioned by members of his own party, seemed abundant proof. Trump’s election seemed to make the case that perhaps the “citizens” are not up to the fulfilling the vital duties of citizenship. When I went back to Syracuse for Ralph’s service, I spent some time in the University Archives. I am working on a book on the history of the Onondaga Nation, and one of the university’s early chancellors was at the center of a number of unsuccessful efforts to break up the Onondaga reservation and allot its lands to individual Indians. 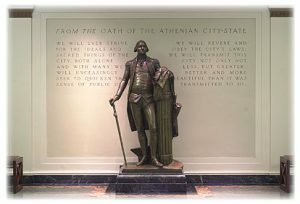 I spent some time there, then ate at one of the few places that remained on Marshall Street from when I was a student there more than twenty five years ago, and then walked up to Maxwell Hall, where I saw in the lobby the statue of George Washington, framed by the Oath of the Athenian City State. 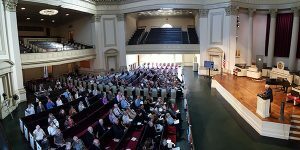 I went to Ralph’s service at Hendricks Chapel, listened to the stories Ralph’s colleagues and former students told, and what I heard there informed how I taught Cicero when I got back to Geneseo the next day. I felt very fortunate to have known Ralph, and to have had him as a teacher. A lot of good memories. And I remembered very clearly that I owed Ralph a lot. When I got to Syracuse in 1990, with a generous fellowship, I had imposter syndrome. Big Time. I had the Maxwell School’s most prestigious fellowship, and at my first class every class meeting at Syracuse, in Ralph’s class–man, some of those people were so smart. It was a history of early American political thought and it drew students from the history department but also from philosophy, political science, public administration, and cultural foundations of education. I found these other students intimidatingly bright, so well-spoken, so confident. But the class was too large for good discussions, Ralph thought, so he broke it into two groups, and I went with the historians. I was doing all right here, I guess, but not well enough to know that I was going to make it in graduate school. Our first paper assignment involved analyzing the works of a number of Puritan writers, some in England like William Ames and the Lord Saye and Sele, and others in America like Roger Williams. John Winthrop factored largely in my paper, and I still use bits of what I wrote when I teach the early history of New England. I cannot recall all of the works we read, but I remember benefiting greatly from working through them. I did the paper, my first in graduate school at Syracuse, and waited apprehensively for the result. Professor Ketcham, if I remember it right, said that both halves of the class would meet as one, a committee of the whole, at his house a short distance from campus that evening. Something had gone wrong, or bothered him about the papers. I cannot remember if this was a conclusion I drew myself, or one that emerged from the usual worried scuttlebutt that ran through the graduate students’ hangout, a bar on the South Campus called the Inn Complete. Professor Ketcham let us have it–gently, but unmistakably so. He mentioned that history or political science of whichever field we were serving our apprenticeships in was, at the end of the day, about writing. He might have said something about stories, but I am not sure. He certainly mentioned the importance of clarity and style as essential ingredients in a persuasive and effective paper. I wish I still had my marked up copy of that paper, but it did not manage to make the trip during one of my many moves since I left Syracuse in 1994. Ralph told us all this, and then he began reading. He said that he wanted to provide an example of an effectively written paper. He began to read mine. I knew that I still did not feel very accomplished, or as if I had just beaten the world. Self-doubt would continue to plague me, as I suspect it does many students of history. But I did feel like I imagine a baseball player feels like after he hits a groundball single in his first at bat. No great accomplishment by itself. Need to keep working, and keep improving. But, still, I can do this. Graduate school in many ways for my cohort of students seemed to generate lots of feelings of inadequacy, of self-doubt, of imposter syndrome. We worried if we would ever find academic jobs, though nearly all of those who finished were lucky enough to do so. I am not sure how typical my program was. At the time, there were some very, very fine historians at Syracuse. One of my classmates, who came to Syracuse via an Ivy League undergraduate program, quipped that Syracuse’s history department had an inferiority complex that we all paid for with a very heavy workload. It came up between beers, wings, and fries at the Inn Complete. I actually liked my time in school, self-doubt aside, and liked doing the reading. No big deal. The paper was read. I got a good grade. But I was grateful for that. It helped me through a trying first year at Syracuse. I was a Southern Californian who had never seen snow fall before in my life, and here I was living three thousand miles away in a city known for its foul weather. For that first class I have always been grateful to Ralph. He was always interested in my work. I know, from our interactions over my four years on campus, and from the times I saw him when I went back, that Ralph thought highly of me and my work. His support was one small piece of the puzzle of how I managed to succeed as a graduate student and an academic historian in my own right. I will be teaching the History of the Early Republic in the spring. I have not taught it since my last year at MSU-Billings, which was twenty years ago. I have always had a fondness for the field–originally I went to Syracuse to study that period. Other things came up along the way and I followed a different path, but I moved back into the field when I researched and wrote my books on Canandaigua and on Eleazer Williams. I have started working through the broader scholarship again, refreshing my memory, making note of what is new. I revisited Ralph’s edition of Madison’s notes from the Constitutional Convention, which he paired with a nice selection of Anti-Federalist writings. I looked again at his Presidents Above Party and his massive and authoritative biography of James Madison. If if were not so huge I would consider using it class. We who succeed in this field are the products of a lot of hard work to be sure, but also of the efforts of those with whom we study. My interpretations of this or that were framed during discussions and debates in reading seminars and my teaching style, I am sure, though it has changed much over the years, still bears traces of Ralph and the other folks who I watched teach, and from whom I learned so much.